I love coming up with creative ways to work on balance exercises for kids. Balance exercises don’t always require standing on one foot. 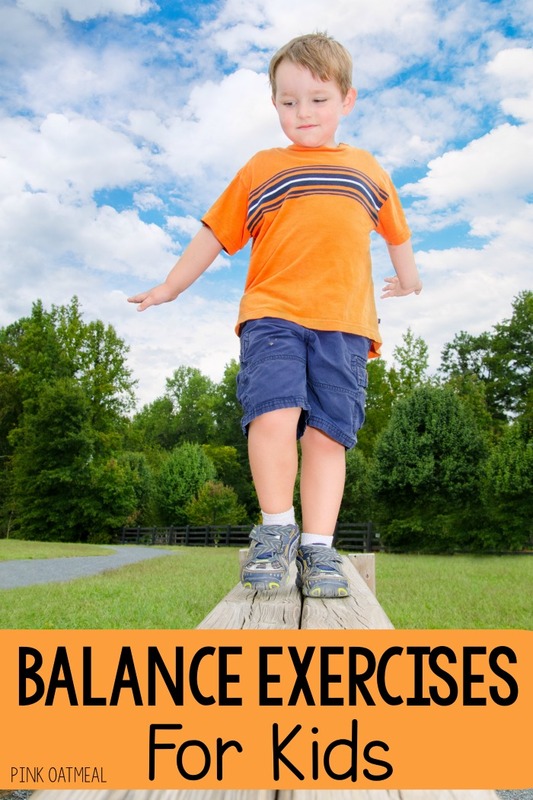 There are several different creative ways that you can work on balance exercise for kids. Today, I’m going to share with you some of my favorite ways to work on balance! There are a variety of different activities that can be done to work on balance. Below are some of my favorites, but I share a ton more exercise and balance ideas for kids in my video library for Pink Oatmeal members. The all access membership is pretty darn amazing. Also be sure to check out so many more gross motor activities for kids! Not every balance exercise requires standing on one leg. Balance exercises can start off simple with challenging a kid to move outside of their base of support. This means reaching outside of where they “feel comfortable” with their balance. 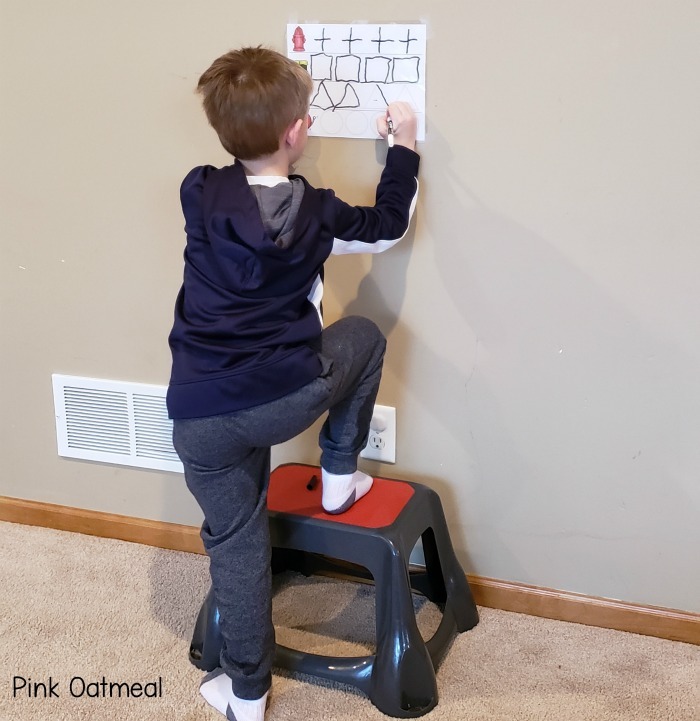 Challenging balance can also be done by placing one leg on a step stool and one leg on the ground. The higher the stool, the greater the balance challenge. To make this activity a little more challenging instead of a step stool add a ball under one leg. Move the ball in all different directions to add to the balance with a ball challenge. When you are ready to work on balance exercises for kids with taking a foot off the ground, make a game of it. The bean bag balance game is a fantastic way to start working on single leg balance and so much fun! Another fun way to work on balance exercises without the kids even realizing it is by playing the balance with blocks game. The higher you build the blocks up the greater the balance challenge! Once you are ready for single leg balance exercises there is so much that you can do. Single leg standing is the basis of most exercises and components can be added from there. Single leg standing reaching outside of the base of support is one fun way to work on this gross motor skill. To make this balance exercise more challenging don’t allow the foot to touch the ground in between taps of the toe. Single leg stance reaching out of the base of support is another great and challenging way to work on balance skills for kids. Vary the distance of the target (cones in this case) to vary the challenge of this balance exercise. Make an obstacle course that requires heel to toe walking. I personally like to theme this depending on the time of year or theme. Play Catch With A Ball – This can be done with both feet challenging the kiddo your working with by throwing the ball slightly outside of their base of support. This activity can also be done in single leg stance. Natural Outdoor Obstacles – Walking logs, rock paths, and more are a great way to challenge balance without needing to set up anything formal or fancy. Balance Beams – Traditional balance beams are another way for kids to work on balance exercises. This can be done as a stand alone activity or as part of an obstacle course. Work on heel to toe walking both forward and backward as well as side stepping. Unstable Surfaces – This can be done by adding a pillow, cushion, deflated ball or air disc to stand on. This can be done with both feet on the object or in single leg standing. 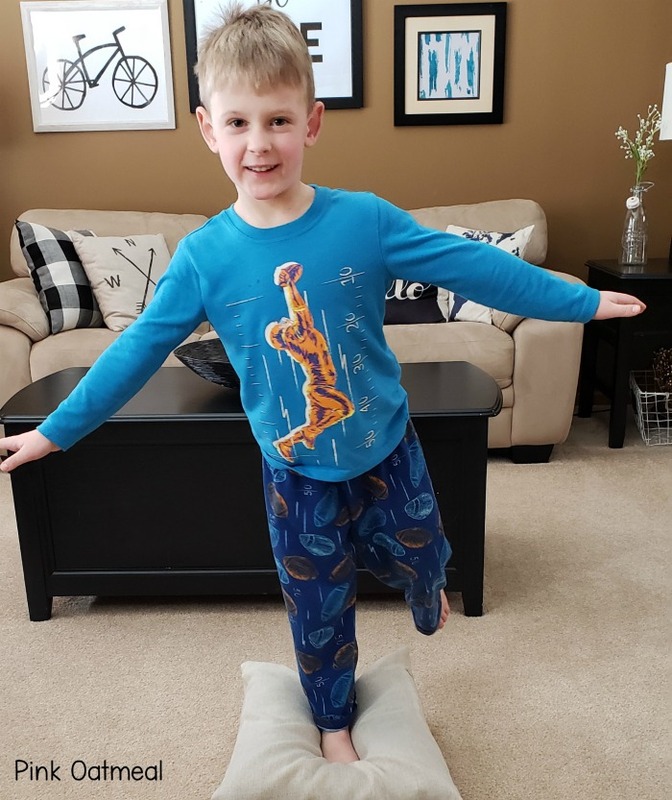 What are your favorite creative ways to work on balance exercises for kids?